On April 20, 1999, two students from Columbine High School in Jefferson County, Colorado, went to school intending to kill as many people as possible. In a 49-minute massacre, Eric Harris and Dylan Klebold killed 12 students and one teacher, shooting many of them at point-blank range. They injured 21 additional people. Three more victims were injured trying to escape the bloodbath. Columbine High School massacre, on Wikipedia.org. Worried parents heard about the shooting as it was underway, and feared for the safety of their children. One of them was Sue Klebold, mother of Dylan Klebold. But Sue’s worry turned to horror when she realized that her son was one of the murderers. 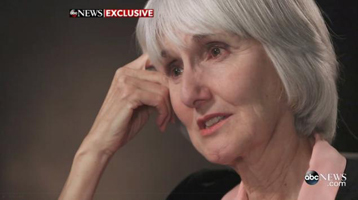 Sue Klebold has never spoken publicly about the tragedy until now. She has just released a book about her experience, A Mother’s Reckoning. She’s donating the money to charity. Sue Kelbold was interviewed last week on ABC 20/20. Five years after the attack, the FBI’s lead investigator and several psychiatrists published their conclusions. They said Harris was a clinical psychopath and Klebold was depressive, influenced by Harris. Watch the video online: Silence broken: A mother’s reckoning, on ABCNews.go.com. Sue Klebold’s memoir about her teenage son, Dylan, one of the Columbine killers, on HoustonChronicle.com. Interesting and very sad 20/20 episode. I perceive Ms. Klebold is taking a lot of responsibility for what her son did, and that she did not foresee and do something to prevent it. I don’t perceive that she did anything much different than many other parents do whose children turn out alright. She sounds like a better mom than I’ve been to my son in many ways. I perceive she is a victim whose son died, very much like the other victims. Her son’s behavior was a bit off, but not really that much different than many other teens’ stages of weird behavior. He kept much of his world private from his parents just like many other teens who happen to turn out ok. It seems like her taking so much blame invites people to blame her in a way. easy to second guess in hind sight ,,,,something like that was unheard of in those days ….notice the counselors & the police missed it as well. brain cant tell fantasy from reality,,,,desensitizing for killing ,,,some one gets u angry & you shoot them? what I am wondering why are young boys at such high risk? I heard both teens were taking anti depression medications of sorts?? …this report does not say that…..
part of being a teen is struggling with moodiness, having depression, experimenting with sense of self & learning to find own ID ,,alternative clothes etc ,,,just bc they buy a trench coat especially in the mountains some how mom should know he is a mass murder? please,,,,there are a lot of goth kids that walk around pale & in black or blue hair who never hurt any one…. in my HS we had all sot of crazy things & kids died…. but in those days kept it quite. SO no copy cats. I think the media attention makes to increase copycat situations and any one out there who is unstable starts to think about doing same. …when was that taken & with whose ok??? imagine that today? & no one ever seems to catch it pre fact? bc its not so easy for any one to predict this ,,,,not for parents not or any one. and why did they destroy the tapes??? they are left to live in for rest of their lives….. I have met Sue Klebold, and found her to be a very kind, intelligent woman. I watched the 20/20 episode and felt she was extremely courageous to share, from her anguished perspective, what her life has been like since that fateful day at Columbine. Knowing that the parents of the two boys have been vilified throughout this country and beyond, and being willing to face the cameras so honestly…I must commend her for her honesty and courage. I pray that somehow she and her ex-husband will find some level of peace, as well as the Harris family, and of course, all the rest of the devastated families and community members affected by the Columbine tragedy. I, too, lost a child (a son), to suicide, as a result of having had children (unknowingly)with a spath/narcissist as a father. In a suicide support group several years ago, another mother of a son lost to suicide said, “We should be thankful that our sons didn’t take anyone else with them.” Having survived the hell on earth of living with the disordered ex, realizing that some members of my family-of-origin are also disordered, and then losing a child due to the spath’s behavior (causing PTSD in myself, and most likely my child)….I think MY life has been hard. I can’t comprehend the pain and utter devastation of ALL of the people affected by that terrible day at Columbine High School. As we know from studying about personality disorders, there seems to be a genetic link. So it’s possible that these boys, or at least one of them, inherited the gene for psychopathy, through no fault of the parents or their parenting. Truly, something of this nature could possibly happen to any of us. I hope all involved will continue to find healing and purpose from surviving this tragedy. Thanks to Donna and Lovefraud for educating all of us about the disordered among us, and for providing a healing place for spath survivors. AlmostLost – I am so sorry for your loss of your son – what a tragedy. Thank you for sharing. Thank you, Donna. It was a tragedy, and one that affects more and more people these days (currently, a suicide happens roughly every 13 minutes in the U.S.– it was every 15 minutes when my son passed in 2006– and is increasingly common). Something that has helped me is to volunteer with suicide prevention and postvention efforts in my area. AND I share Lovefraud with women who indicate to me they are dealing with abuse issues. I read a book shortly after the loss of my son. It stated that children who witness domestic violence are SIX TIMES as likely to take their own lives. So you can imagine the lifelong and often deadly aftermath for anyone connected to a sociopathic/narcissistic abuser. If only I’d known all this before I met the ex…so THANK YOU for helping others identify the signs of spaths/narcs. You are certainly saving lives! Has anyone here ever seen the Michael Moore film Bowling for Columbine? He looks at the culture of guns and violence in our country as it relates to the Columbine shooting. It’s very thought provoking. I remember the day the shooting happened. I was in massage school at the time. One of my classmates was waiting tables at a restaurant right across the street from Columbine High School in Littleton, CO and heard the shots. She came in to class pretty shaken up. It was a grim and very surreal day for us in the Denver area. I don’t know why Colorado is the home to so many of these shootings. I think there are many cultural forces that contribute to this kind of behavior, and it is easy to scapegoat the parents, when in fact, they are just one influence, and there are societal influences on them, as well. Depression and isolation are an epidemic in our society. I don’t know what the statistics are, but at least one or two out of every ten people I know are on some sort of anti-depressant. The young and impressionable are very vulnerable, but so are people over 55, who are not really regarded with as much respect in our society as they are in many other societies. In the case of Klebold, his depression made him vulnerable to the influence of a dangerous sociopath with deadly consequences. I don’t really know what can be learned from a tragedy like this or what meaning the survivors and their families can find. But blaming the parents is a simplistic – and IMO wrong – way to view the situation. How can a parent know what they don’t know? Littleton is a fairly affluent area in general. I was told by one of the nurse practitioners I work with that the kids in more affluent areas are more likely to be admitted to the hospital for psych issues. There seems to be a negative correlation between affluence and connectedness of family members to each other, sadly. When parents have to work so much to maintain a certain material quality of life, they are often able to give their kids all kinds of material things – phones, Ipads, Ipods, etc. But they can’t give as much of their time, which is what the kids really need. I am not saying this is true in every case – but it seems to be a pattern. Stargazer – the lack of connection that many people – including teenagers – feel to others is exactly the problem. And it is fostered by our materialistic society. I wonder how we can turn it off? That’s a good question, Donna. I think awareness is key. Entire families can be disconnected from one another, but often the child is the “identified patient.” Any time an adult can begin to connect with their own inner world, they will have better relationships with their children. I have read about addiction that the determining factor as to whether someone becomes an addict or not has nothing to do with the substance itself. Rather, the person cannot have healthy connections with others in the first place, so they bond with the substance as the next best thing. Usually it is caused by some sort of trauma, as in the prolonged trauma of growing up with abuse/neglect. Once again, awareness is key. As more and more people find ways to heal and release trauma, society will be better as a whole. I visualize a society where it is safe for a depressed person to reach out for help and the help is abundant in a more enlightened society. In the meantime, enlightened parents would do well taking their kids to spend some time in a third world country such as Costa Rica perhaps volunteering in a poor town. This will give them a perspective on materialism. It’s also very hard to feel isolated there, and there are few distractions in the way of material things. You know, it’s the hundredth monkey syndrome. The more people begin to connect, the more it will catch on, until our whole society shifts consciousness. You are right about the Littleton area (and surrounding areas) in general, being very affluent. I live in one of the Denver suburbs, though I am still single and working hard to support myself (my other children are out on their own), and am not in the “affluent” category. Just a short time ago, two teenaged girls were arrested (and charged as adults) for their plan to shoot up a high school in Highlands Ranch, a suburb of Denver just south of Littleton. Thankfully, someone who heard about their plot let adults know, and the carnage was prevented. From my perspective, it seems empathy and compassion for others and the less-privileged are often lacking in these highly-privileged kids. (I’m told of 3 years olds being given Ipads of their own!) And the epidemic of bullying, now hugely magnified by social media, the ease of purchasing various types of firearms, lack of family time together due to both parents working…it’s a perfect storm for these types of tragedies. AlmostLost, along with what you said, add in a culture that glorifies guns and Voila! It really is the perfect condition for these things to happen. To my thinking, the deeper problem is the lack of connection in our society – to our own inner world and to each other. Change requires a shift in consciousness for our culture, which starts one mind at a time. We need to provide young people with opportunities to hang out with enlightened communities who radiate a high level of love and acceptance and who don’t place that much value on material things. Youth activities should not be limited to sports and academic studies. There are some places where it’s very easy to find those kind of communities, like Boulder, CO, which sits on some sort of vortex of higher vibration so I hear. But much more difficult to find conscious communities in smaller towns. Those communities would have to be intentional, and that’s what I’m hoping to build in my next move to the smaller town of Pueblo, CO.
At the same time, we need to ask ourselves why it’s so damn easy for a teenager to go out and buy a machine gun and a boat load of bullets. This whole “right to bear arms” thing has gotten really out of hand IMO. It can rise to levels of paranoia, with so many people fearing the the enemy is around every curve. I think this line of thinking and the glorification of guns is very dangerous and opposite of creating a more enlightened society. And you are right – it’s the kids from more affluent families who have money, resources, and time on their hands. I’m so very sorry for the loss of your son. I cannot even imagine. Thank you, Stargazer. I never thought my life would turn out as it has…it’s been tremendously challenging, but I feel like SOMETHING good has to come out of it, otherwise, what’s the purpose of it all? I believe part of the reason for the relatively high number of suicides in the states of Colorado, Wyoming, and Montana relates to the dearth of mental health care, the great EASE of getting firearms, and the “right to bear arms” mindset. (But doesn’t the Constitution say this is “during times of militia”?? ?—not just any old time you feel like getting a gun?) There is also some research I’ve become aware of that has found higher suicide rates in areas with higher elevations, like CO, around the world. Interesting. Anyway, thanks again for your kind words. My son’s loss has definitely forever changed my children and myself. I can only hope to make something good come of it by using my experiences as a way of helping others. Educating people about sociopaths hopefully will prevent some other mother from losing a child in this devastating manner. Education is really the key, and supporting each other as survivors is critical. We understand each other! I am one who does not believe suicide is horrible or evil or even selfish. I think it is a sane person’s response to their pain being greater than their resources. Right now, our society is very ill equipped to deal with people in deep emotional pain, I know from experience. It is a rare person who finds their way out of it – more the exception than the rule. You cannot even have yourself hospitalized unless you have health insurance or are independently wealthy. Several years ago, there was a guy in the news who opened fire in a synagogue on the East coast. Reportly, he tried to have himself hospitalized before it happened. The hospital turned him away for lack of insurance. This is a really really big problem when a person who is suffering doesn’t know where to turn. Here in America, we are all supposed to smile and put on a brave face. In other cultures, people are more genuine and authentic. If you known anyone from Eastern Europe, they don’t walk around with a smile plastered on their face telling everyone glibly to “have a nice day.” They let their face rest in whatever emotion they are experiencing. I think it is truly remarkable and admirable that you find meaning in your son’s death. If you can turn this into something meaningful, imagine how powerful you can be in bringing about change. I do believe that one person can create a huge ripple effect. Personally, my heroes and role models are people who take an unthinkable situation and turn it around into something positive. David Pelzer and Jaycee Dugard are amongst my role models. Thank you for your kind words. I have come to understand a lot about suicide, as well as sociopathy, narcissism, and the behavior of disordered individuals. What an education, at a very high, high price, unfortunately. I feel that what I have gone through has enabled me to be in a good position to help others walking this difficult journey, and for me, at least, it is very healing to be able to help others. I do help with a suicide support group in my area, so it’s a good place to share. I will say, too, that my faith and sense of spirituality has greatly deepened, and gives me comfort and hope for the future. It is so important to educate others about all these topics. I still see so much misunderstanding, ignorance, and denial about personality disorders, so I am so glad to tell people about Lovefraud. Donna, and the folks who share their stories and expertise here are helping so many people. Thanks again, Stargazer, for your wise words! AlmostLost, you are an inspiration. I tried to commit suicide when I was 14 and was deeply depressed for many years following but didn’t have the psychological sophistication to understand it, never mind the resources to get help. I’m sure if there had been people like you around, I may have had an easier recovery. I am 55 now, and I’m amazed at how at how many more resources there are for people suffering from depression, especially with the internet. However, we still have a long way to go to turn the corner to become a society geared toward health rather than sickness. Glad to see you are back and I hope you enjoyed your vacation. As always… not in a stalker sense 🙂 it’s a pleasure to read your advice and testimonials. Almost lost, sorry for your lost. Lately, I have been worried about my son committing suicide not directly but indirectly. He’s only 30 with 4 kids and a wife. The youngest has been struggling with health issues since birth. They only gave her 2 weeks to live but God. However, the financial impact and the stress it has been placed on the family has been tremendous. He’s an only child and have had to step up. The baby has been in and out of hospital for 2 years. He has withdrawn and I no longer hear the voice of that over confident cheerful guy. I’m not a counselor myself, but I will keep your family in my thoughts and prayers. I hope the little one’s health improves, and somehow, the stress lessens for everyone. Many blessings to you, your son, and his family, too. Stargazer, thank you again for your kindness. I am sorry for your struggles, but glad that you are here, as you can help others, even by writing here on Lovefraud! I had suicidal thoughts at the end of the marriage, but thankfully realized I could not leave 3 children to him/it! I did turn to my higher power (God)as I was at my wit’s end. There were definitely things that happened that were very unusual–but good!–, and I do believe they were “God things” (and my counselor agreed). All these things did strengthen my faith. When I lost my son, my family (not the ex, to my knowledge) all had experiences with signs from him, and I know, as do many other bereaved people (especially when a loved one is lost suddenly and unexpectedly), that ADC’s (after-death communications) are real. And I am so thankful, as I know that my son exists, just in spirit form, and that I will see him again one day. All these things have really helped me to accept that what I’ve survived during my time on earth, while so difficult, happened for a reason. My belief is that they happened so that I could be able to help others with their struggles on their own difficult journeys. Right now, I am working as hard as I can, as I am a bit older than you, to support myself, help my remaining kids and grandchildren when needed, and try to save for a time when I might be unable to work. BUT, I do plan to write a book about my experiences…to explain to people what life with disordered folks is like, and the consequences of being uneducated about personality disorders and the damages to the family from such individuals. I hope to be able to do that before I leave this earth. I want my life’s experiences to be used for good, so GOOD WINS, not EVIL! You might look into the American Foundation for Suicide Prevention in your area. They can use all the volunteers and support they can get! As parents, even when we see inappropriate behaviors in our child, getting serious help to impact their mindset is very difficult. Although I took my son to 3 separate therapists at various points in his development, and he was admitted to a school that dealt with special needs kids, not a single mental health professional enlightened me that I was seeing very classic signs of Borderline Personality Disorder in the making. They were all into putting a band aide on his attitutde, but not getting to the bottom of where it came from. When I look back, I see “textbook” behaviors. No one wants to “label,” as if doing so would cement the child’s fate. That mentality needs to change. Having an emotionally disturbed child is a nightmare you can’t wake up from. I was fortunate that my son only became heartless, but not a murderer, although, he was caught taking a bee-bee gun (that his father had bought for his brothers, one that I thought had been removed when we parted ways,) to college. His roommates turned him in. I get the impression he used it to intimidate them. He was expelled from the dorm. It was the fourth time a school banished him. I can relate to Diane Sawyer’s remark about how Sue Klebold was sentenced to a life of grief with no parole. There is no solace when you’re parted from your child, no matter what they have done. Today, I have concerns for the young lady who is currently enabling my son. She has two young children. When she contacted me with the first news about him I’d received in 7 years, I let her know he should be working with a specialist. Of course, he convinced her that I’m nuts, and she should not believe anything I have to say. I wish that society was more informed about checking a person’s background before they become emotionally involved. I pray for their welfare and my son’s. His condition puts him at high risk for suicide. I love my son with all my heart. But I also recognize who he is and I would give anything to get him the therapy he needs. Consistent with the beliefs that accompany his disordered reasoning, in his eyes, everyone else is wrong. Emotionally disturbed kids need treatment long before they turn 18. Once they do, you have absolutely no legal control over their mental health needs, even if you pay their insurance and doctors’ bills.